Last seen at the end of fairly well executed double spey. A man should tie his own flies. The other day a relative says to me something like, "There's a fly fishing store by my office and I thought of buying a Christmas present for you there. But what the hell am I gonna get for you; the angler that has everything?" Two words for you Cousin Earl, two simple words. Bass Bugs. Most times I do tie my own flies. Even if it means driving to three or four different fly shops to get the right materials for a particular pattern, gas prices be damned. In the long run it's cheaper though sometimes it seems like I'll have to tie flies for a long time yet to realize the cost benefit. 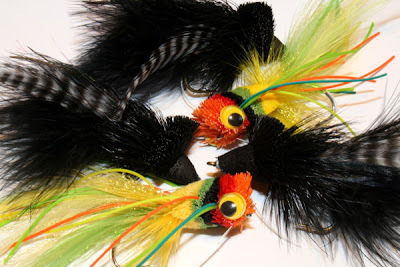 When it comes to bass flies, the big poppers, sliders and divers, I opt for the store bought variety. Too much work; spinning, stacking then shaping all that deer hair. A professionally tied deer hair bass bug goes for something like four or five dollars a piece. It would take me at least an hour to turn out a Dahlberg Diver or Messinger's Frog that looked half as good as the original. Hell even my boss thinks my time is worth five bucks an hour. So....thanks Mom, I finally used that Bass Pro Shops Gift card you got me last year. Pass the word around, maybe Cousin Earl will catch on.